There’s a lot to say about the world the Flintstones lived in, but our biggest questions arise out of the way they used animals for machinery. Now, the brontosaurus Fred used to mine gravel, that makes sense. That’s a big creature, a lot of power, and seeing as how it’s outdoors it can’t make too much of a mess. But it gets less reasonable from there. The Flintstones kept 18 types of bird in their house alone, and they used them as things like letter openers, cameras, brooms, sewing machines, alarm clocks, even knitting needles. How economical is it to house, feed, and otherwise look after a live, talking bird just so you can use its head to rake leaves a few times a year? Is anyone besides us actually bothered by this? It just doesn’t make sense, as if The Flintstones is just a big joke. And to top it all off, their car was the only thing in their world that people powered themselves. Literally the most practical application of animals ever, and they overlooked that one thing. But of course they had to have an octopus dishwasher. Thanks for hearing us out. 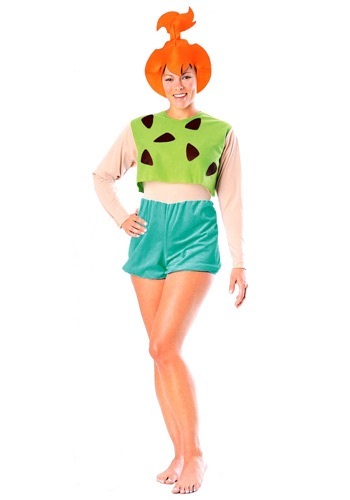 That said, The Flintstones is the best cartoon ever and you should dress up as a character from it. So why not Pebbles? You’ll look just like her in our Pebbles Costume, which comes with the atavistic tot’s signature animal print top and shorts and her shock of blaze orange hair. Go with a Bamm-Bamm and you’re sure to win hearts. But please don’t bother any birds, they’ve got enough to do what with migration and eating seeds and all. It's overpriced for what you get, and can be found cheaper at other stores. It fits weird and even though it's hard to get it past my hips, it's actually big on me once it's on. The little headpiece came in terribly and doesn't even stay upright on my head. I loved the idea, thought it was a great concept, but the delivery was subpar.